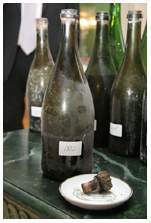 The Champagne is believed to date, like the ship, to the 1780's, and the oldest Champagne vintage of which bottles still survive is the 1825 Perrier-Jouet (pictured). The divers know it's Champagne, and that it's drinkable, because they immediately opened a bottle and tasted it. "It tasted fantastic. It was a very sweet champagne, with a tobacco taste and oak." I can't say that I blame them. The remaining bottles may be worth as much as $68,000 each, so chances are they aren't going to get many more opportunities to taste it.